Hello Deborah, wow thimbleberry jam sounds so interesting and no I have never had it or heard of it. I would love to try it sometime. It looks so good on the cornbread. I hope you have a nice weekend. I've never heard of thimbleberries - I'm sure those who enjoy sewing would love them! (ha ha) Love the little peek into your dollshouse. 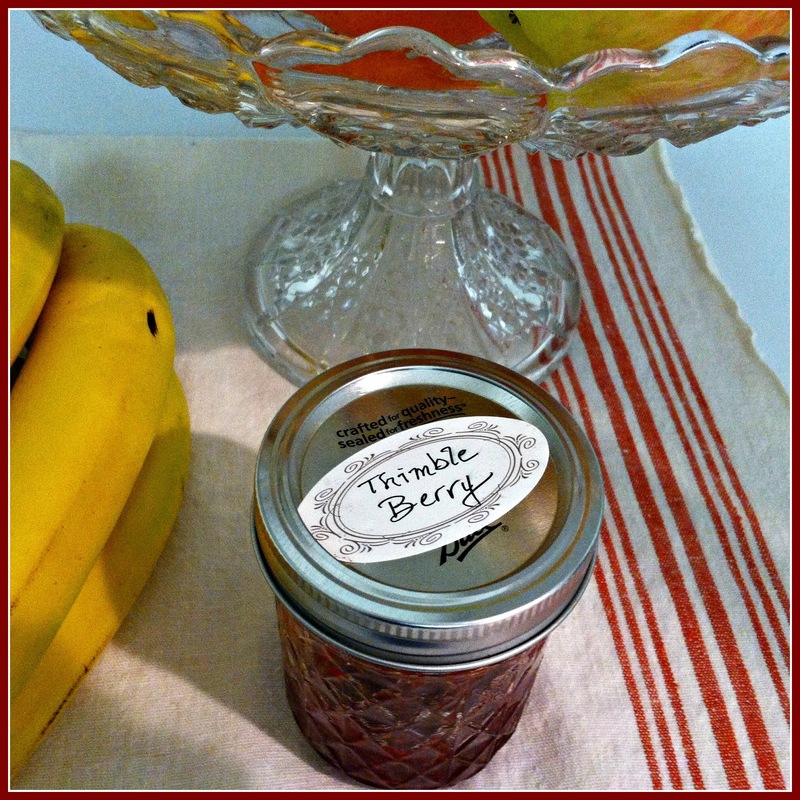 I have never come across thimbleberry jam before. Love the doll house, a real delight. What a lovely piece of whimsy to start my day. Thank you! Hey pretty lady! How are you? I hope your new year is off to a good start. I've never heard of this fruit and of course, never had the jam. Your post is so whimsy and adorable. Nice to visit. Enjoy your weekend. Exactly, Beatrix Potter or Tasha Tudor! A good jam is one of the simple luxuries of life. 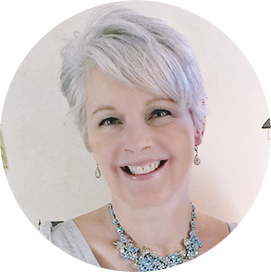 The way you told your captivating story about the dollhouse family! You for sure ate something very special and the first time I hear about it. Hi Deborah, I too, have never heard of thimbleberries. And I didn't know you had a cute little dollhouse?! Very cute, love the different wallpapers! I've never heard of thimbleberries, Deborah, but I'm sure I'd love them since raspberries are my favorite. Your little doll house and the family were fun to take a peek at. Isn't it nice to still enjoy playing? They do sound enchanting...but I have never heard of them before. It is nice to learn about them. I must ask some of my "out west" friends. I also enjoyed the peek into your dollhouse. Very darling! I so love your doll house! !So cute! 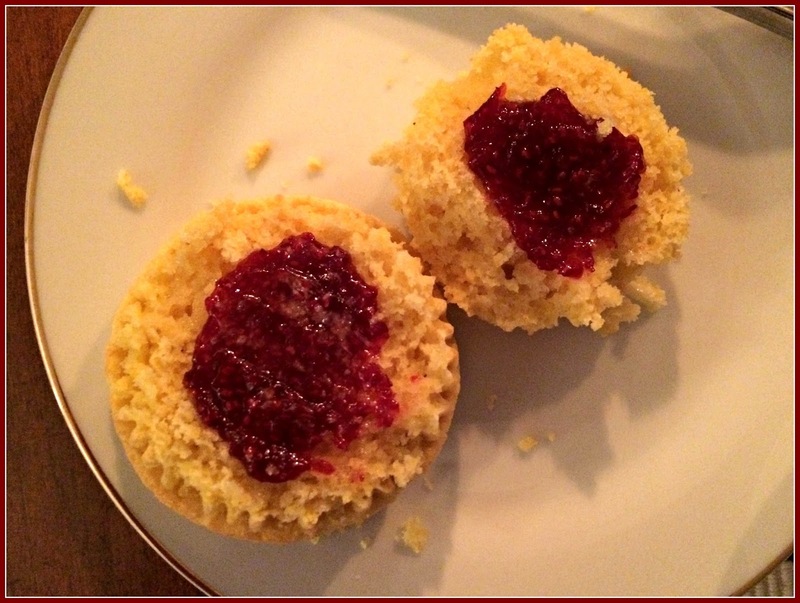 Oh those little cakes with your Thimbleberry jam look so yummy. I have never heard of this fruit before. I am sure one must feel a bit special with such a special treat. Make sure to make it last until you can get a hold on another jar. Deborah, could you send me your email address? I'd like to respond to your comment and you show up as a no reply blogger. BTW, I agree with you! Thanks. Well I guess I am the first here to say I know all about thimbleberry jam! I use to make it every year. It grows along side the old railroad grade behind our home. Your doll house and story is so sweet! I have never had thimbleberry jam, Deborah. But if it tastes like raspberry jam with smaller seeds then I would love it! Loved your little story about the family in the doll house. Very sweet! Your post was very fun! Thank you for sharing and have a lovely week. Just too, too cute! I didn't know you had a dollhouse too! Always a good thing to know! Never heard of Thimbleberries - they sound heavenly, yum! I need to look up that jam and see if I can find it online. It sounds lovely. I hope you're enjoying the new year. I'm like you with the should, so I'm trying to stop that as well. Deborah, I want to just shrink myself down and jump inside that adorable doll house and live there! And I'll sit at the kitchen table and eat thimbleberry jam on a biscuit! Seriously, I have never heard of it but sure sounds like something I would love. Sweet post! Fun post! Your little family has a lovely abode! And I wouldn't blame them for trying some of your thimbleberry jam. Sounds delicious! I was given sone jam as a gift last year by my sister and I wonder if it could have been this. I love raspberries...but this jam seemed to have a different berry in it. It was really good. Love your dollhouse...soooo cute! Hi Deborah, I have not heard of this jam. It sure looks delicious. Love the doll house! Such a darling interior and little family. Deborah, your doll house is SO cute! The cook stove and coal bucket caught my eye (of course) and while I've heard of thimbleberry fruit, I've never tasted it. I had raspberry jam with breakfast yesterday and it was delicious. A woman's retreat...sigh. I bet it was wonderful! Oh this is such a lovely post - I'm a huge Beatrix Potter fan! I agree she would have been familiar with thimbleberries and I'm sure Peter Rabbit would have know just where to find them too! Well, I am late to your party Deborah! However, I am VERY familiar with thimbleberry jam! Thimbleberries grow wild here where I live, and are very fruitful, and bountiful! And you are so right, they don't transport or hold up very well, and usually need to be processed the same day they are picked. They taste just like raspberries, but a bit more tart, and not as much firmness. My kids and I enjoy picking them, and oftentimes we eat more than we can bring home, lol... or at least the kids do. So I don't often have enough of them for jam, but will mix in raspberries with them in order to be able to make the jam... it is quite tasty... so keep a close eye on your dollhouse people, lol! 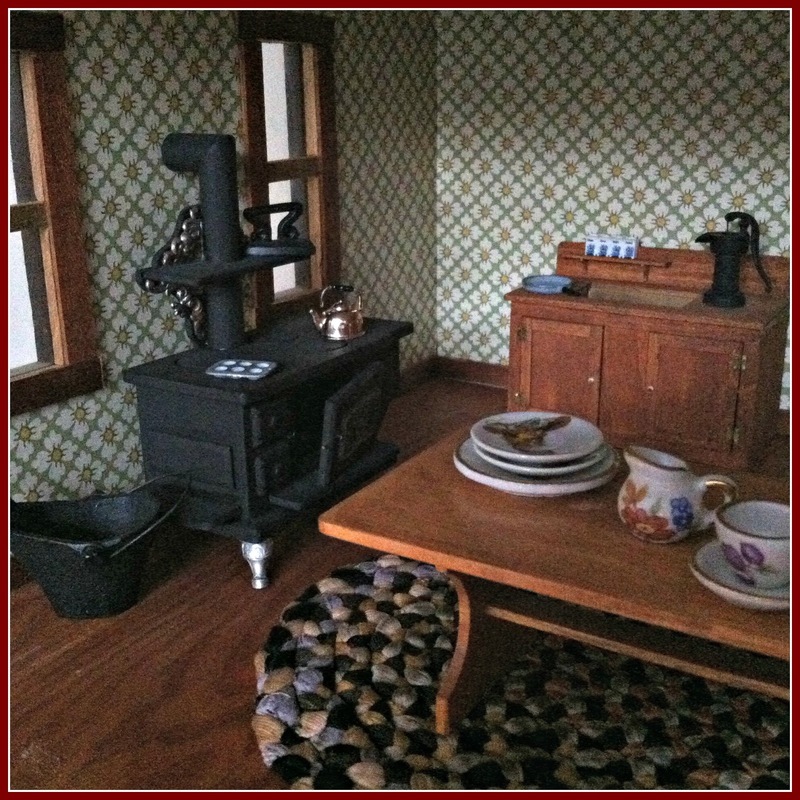 It was a delight to read your post today, and the special story with your dollhouse - which I must say is absolutely amazing! The detail in it! Hey pretty girl, how are you? How are the wedding plans coming up? I bet it's close now and you are excited for your DD. Thank you for your sweet visit, you made my day for sure! Oh, Deborah! What an absolutely charming post! 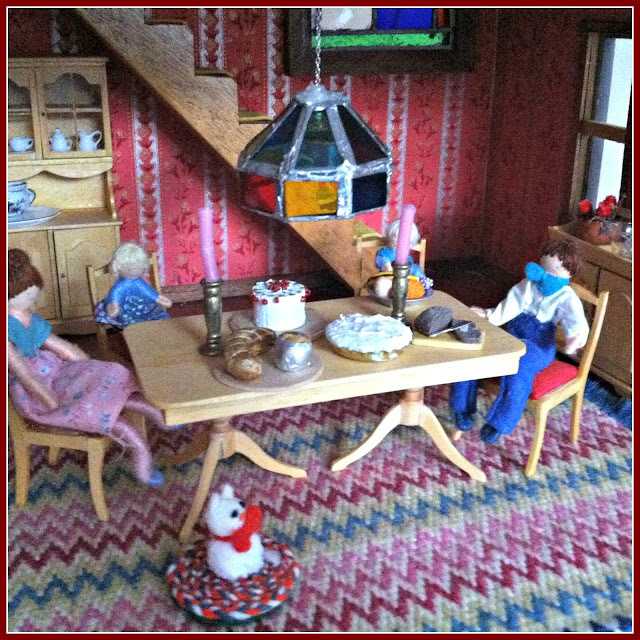 All the whimsy and the magical moments, and that dollhouse!! 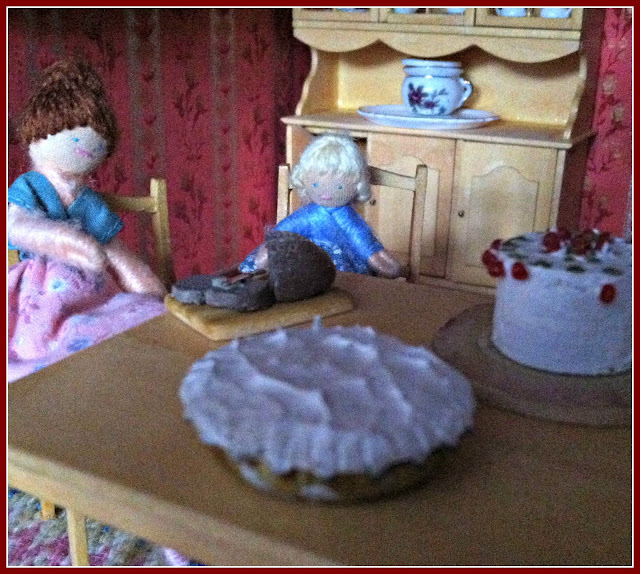 Those little people are certainly lucky---such a marvelous landlord, that CAKE, that PIE, and the prospect of Thimbleberry jam, on top---what a feast. I've lost track of lots of my "people" in the past year, and just this morning saw a comment from you on LAWN TEA, way back in 2014, so I was delighted to find the link, and FIND you again. And that the post was about such a sweet thing---you know, I wrote about Thimbleberry Jam (well actually TEA) perhaps ten or twelve years ago, for our little GrandDaughter we called the FAIRY GIRL, and somehow I thought I might have even made up the word. Thank you for the remembrance, the reference, and for still posting about such beautiful, charming subjects. I look forward to catching up on all I've missed!! And the flavour you imagine will come streaming from the spout. Lemon, Thimbleberry, Moonbeam---what the drinker has in mind. I've never heard of Thimbleberry Jam but I would sure like to try it! I'll have to google it to see if I can find any online! It looks delicious on those corn muffins! Your little dollhouse is so charming....I was admiring the tiny tiffany lamp! Such sweet little details in there!!! I love the very sound of the word "thimbleberries" -- does indeed sound like something out of Beatrix Potter. I can't believe I've never heard of them during some of my travels in Michigan or from my Michigander relatives, but then they're not really jam people. 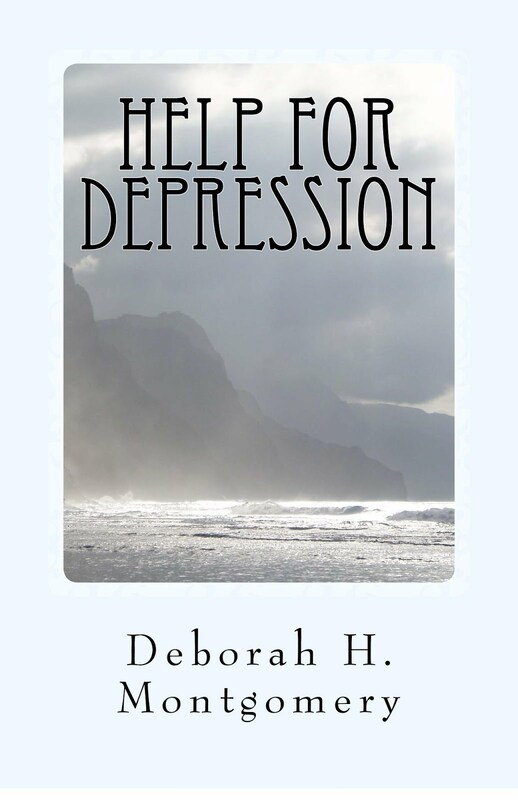 Sweet post, Deborah! I agree with you, they do sound like something out of a storybook, but then, the woodsy creekside where we found them was all like a fairyland to me at the time. I think I can even now remember what they taste like. I'm glad you re-posted this...I've never heard of these berries...sure looks good.